Have you tried Japanese cheesecake before? Japanese cheesecake is pillowy soft, with cottony texture and soufflé like crumbs. When it is fresh from the oven, the cake is so soft that it jiggles like soufflé! That is why is called soufflé cheesecake in Japan. It involves (a) beating the egg whites separately to become meringue and (b) bake in a water bath. 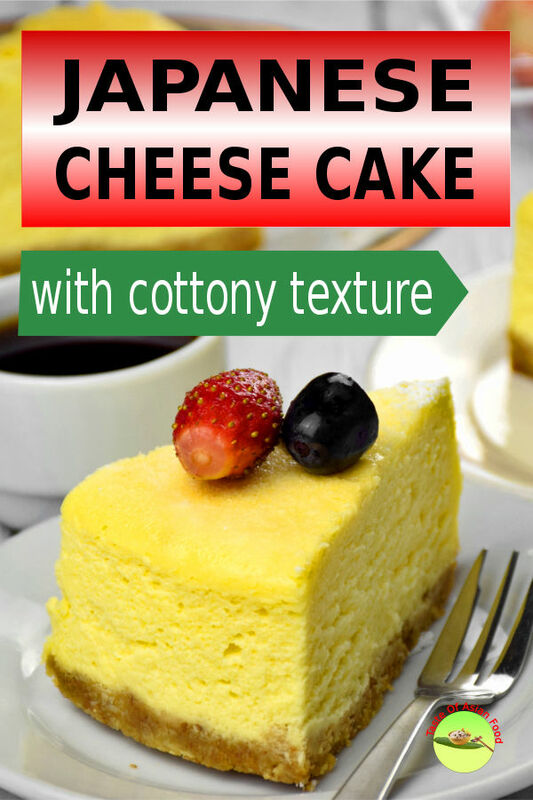 In this article, I will explain how to make this Japanese cotton cheesecake in details. 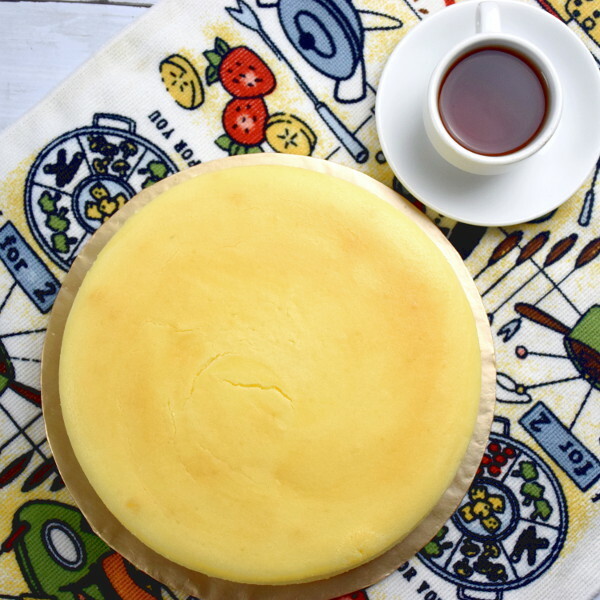 I will break down how I make the Japanese cheesecake into six steps (plus one bonus step !). It is critical to know how to control the quality to achieve the appearance, texture, and flavor precisely what you are expecting. Note: This post may contain affiliate links. Please read my disclosure for more into. I may receive commissions for purchases made through links in this post. Step 1- Mix the cream cheese, sugar, and butter. Use cream cheese only, not any other types of cheese. Take the cream cheese from the fridge and leave it at room temperature for at least half an hour to let it soften. (Note: I stay in Malaysia, a tropical country). Cream cheese should be in the spreadable form so that it is easy to beat. 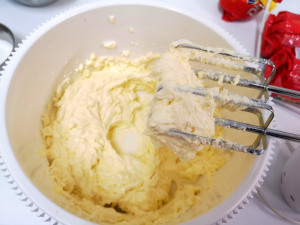 Measure the amount of cream cheese, sugar, and butter and place them in the mixing bowl. 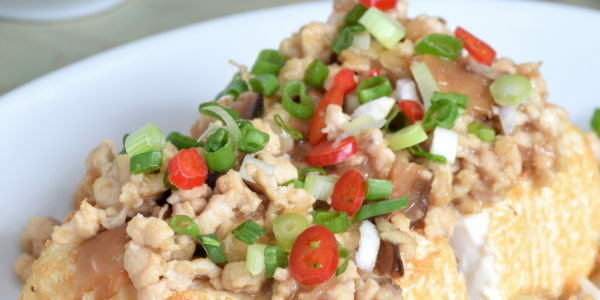 After having a cup of coffee and breakfast, the cream cheese and butter has softened, which can be mixed with ease. How long do you need to mix them? The end point is when the cheese, sugar, and butter become homogenous, means there are no noticeable lumps with a texture resemble thick cream. It will take three to four minutes on average. Type of sugar. As for the sugar, I find that castor sugar is most suitable. If you are not able to get castor sugar, use granulated sugar instead. Mix the egg and cornstarch with the cheese and butter. Crack three eggs carefully so that the egg yolks are intact. Place three yolks and 1 1/2 whites in one bowl and the remaining whites in another. Use an oil-free bowl. Since we want to make meringue with the egg white, be sure the bowl is free from oil. It is also easier to beat the egg white later by placing them into a stainless steel bowl. Beat the egg whites plus yolks portion until light and fluffy. Then add the cornflour and continue beating it with the beater until homogenous. Pour the egg and cornstarch mixture into a mixing bowl which contains the cream cheese, butter, and sugar. Scrape the bowl with a rubber spatula. Mix for another a minute or two until there are no longer any lumps noticeable. Do not bother too much the size of the eggs. I use eggs that are about 50g to make the Japanese cheesecake and turned out well. However, you do not need to make any adjustment with larger eggs. I use heavy cream in this recipe. When you purchase the cream, check the label and it should contain about 36% of fat. I have not tried to use any other cream with lower fat content so that I will stick to heavy cream in this recipe. Beat the heavy cream in a stainless steel bowl with a handheld mixer, until it forms soft peaks when you lift up the beater from the batter. 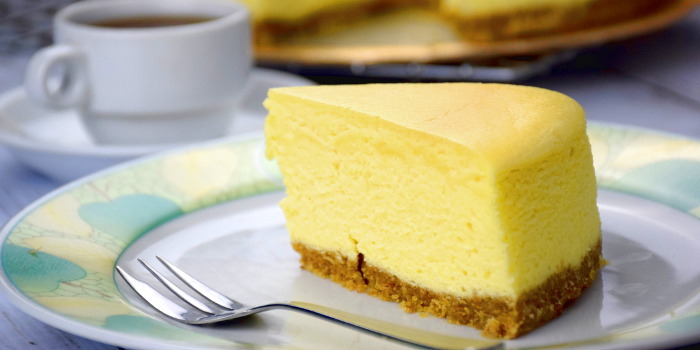 The cream will trap more air in its structure, which helps to create the light and fluffy texture of the cheesecake. You can speed up the process by putting the stainless steel bowl in a tray filled with ice water, but since I keep my cream in the refrigerator, I can whip up the cream to achieve the soft peak consistency in just two to three minutes. You may also want to add some lemon rind into it, but I think it is a personal preference. I prefer a smooth texture, so I just use lemon juice alone. After adding the cream and lemon juice, mix again until light and fluffy. Scrape the sides of the bowl with a soft spatula at least once as the beater cannot reach every part of the mixing bowl. 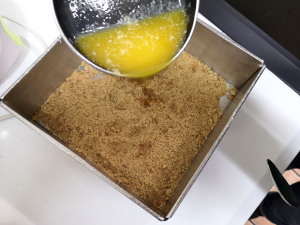 Mixing will trap more air into the batter, which helps to create the volume. The major difference between Japanese cheesecake and the other cheesecake is that the egg whites are beaten separately, which makes it so soft that it jiggles like soufflé! Beat the egg whites at medium speed in a separate bowl until it forms soft peaks, i.e., when the peaks curl down when the beaters are lifted up. It is important that the bowl is free from oil and the egg whites contain no specks of yolk. OIl can hinder the process of building up the volume of egg white. Therefore, I usually clean the beaters and the stainless steel bowl with dishwashing liquid and wipe with a kitchen towel. 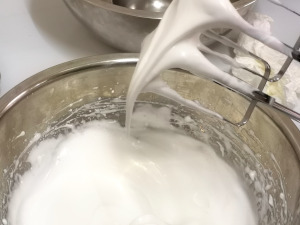 Placing the bowl of egg whites in a hot water bath can speed up the formation of meringue. I usually use a stainless steel bowl for this purpose as it is easy to keep clean from oil and will warm up quickly by the hot water bath. To begin with, beat the bowl of egg whites until it produces foam, much like the appearance of a glass of beer. Then add all the castor sugar into it and keep beating. Beat the egg whites until it forms soft peaks. Do not beat the meringue until it is too stiff. Note that making this meringue does not require cream of tartar, which is the standard ingredient in many meringue recipes. Cream of tartar helps to form a stiffer meringue and react with the baking soda for leavening. Since we do not need stiff meringue and the leavening effect, there is no reason to include it in the recipe. In fact, it is easier to combine the meringue with soft peaks into the batter, rather than stiff meringue. In contrast, it is far more difficult to fold in the meringue with stiff peaks, as there will be specks of egg whites remain. When this happens, you will tend to mix it longer, hoping that you can obtain a smooth texture. Prolong mixing will deflate the batter, which results in a denser cheesecake. (Not what I want for soufflés like cheesecake.). Note: As for my other recipes such as Singapore noodles and Chinese fried rice, there is NO such thing called Japanese cheesecake in bakeries in Japan. Using the name of a country to describe specific food available in a region is a common practice by foreigners. Use a springform pan to make cheesecake or a cake pan with a detachable base, as it is challenging to remove from the standard cake pan. You may want to grease the sides of the pan with butter, but I do not suggest to line the sides with parchment paper, as it can cause the Japanese cheesecake looks crumbly. You can detach the cake from the pan by running a sharp knife or blade immediately after removing it from the oven. Bake the cheesecake in a hot water bath to prevent the cheesecake from overheating. Fill a baking pan or shallow tray with hot water and place the cake pan with batter in it. Bake at 160°C/320°F for 30 minutes, and then at 150°C/300°F for 60 minutes. Please take note that the temperature setting of most ovens may not be accurate. The actual temperature of the oven depends very much on the position of the heating elements in the oven. You may need to adjust the temperature and timing setting. If in doubt, get an oven thermometer to check the actual temperature of your oven. The initial highs temperature will cause rapid raising of the cake in the oven, which help to form a light and soft texture. The subsequent lower temperature of baking is to avoid cracking of the surface as a result of excessive heat. My goal is to produce a melt-in-the-mouth texture. I can get this texture with the above ratio of ingredients, temperature, and proportion. I find that the cheesecake will become harder if I bake it for more than 100 minutes. I like the cheesecake to be as plain as possible, without glazing the top or decorate it. In this regard, I would prefer the color of the surface to be slightly darker. Open the oven door and take a peep of the cheesecake. If the color is not dark enough, increase the top temperature to 160°C/320°F for an additional 5 minutes to brown it further, if necessary. 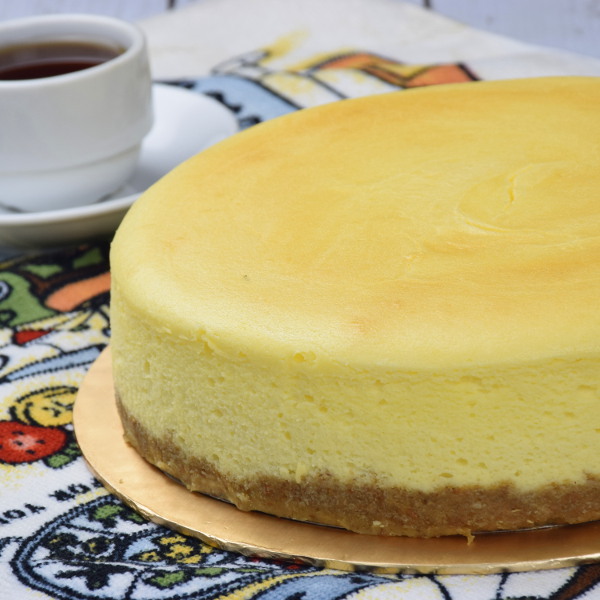 After baking, remove the cheesecake from the oven and leave it at room temperature to let it cool. Use a pair of oven mitts to avoid burning your hands accidentally. (I had some bad experience with my commercial oven before!) Some recipe suggests to leave it in the oven with the oven door ajar to let it cool down slowly. I find that it is not necessary as I have tried it before, but there is no significant difference. I prefer to remove the cheesecake from the water bath as soon as I take it out from the oven. This step is to prevent the water seeps into the cake if you are using the springboard or detachable bottom cake pan. Run a sharp knife along the sides of the cake pan to prevent the cheesecake from sticking to it before removing from the pan. Let the cheesecake cool down at room temperature for about thirty minutes before removing it from the cake pan. If you remove it too soon, the sides of the cheesecake will become crumbly as the cheese is not fully solidified yet at this point. However, the cheesecake will still jiggle, and you may not be able to resist the temptation to do so. If you are not using a detachable cake pan, you can use a cake board to cover the cake pan, then invert the cake onto it. Remove the parchment paper at the bottom of the cake and place another cake board at the bottom and invert it back. Wrap the sides with the plastic strips to prevent the cake from drying. Cover the top of the cheesecake with another piece of plastic film since I do not intend to glaze or decorate it. Leave it to cool before keeping it in the refrigerator. It should be able to stay fresh a three to four days if kept refrigerated. This soufflé like Japanese cheesecake is best to serve when it is chilled! Keep it in the refrigerator for three to four hours before serving it. The cheesecake is set by now and can be cut easily into wedges. This step is optional. Most of the soufflé-like cheesecake in Japan do not have a biscuit base like those typical cheesecakes. But since I like to have a base, I will make one, and show you how to do it if we are like-minded people. Place the digestive biscuits in a plastic bag and grind it with a rolling pin, then mix well with melted butter. To form the crust base of the cheesecake, pour the digestive biscuits and butter mixture to the cake pan. Spread it out evenly and compress it into a solid flat layer with a flat spatula and spoon. Making sure the layer of the biscuit is well-compressed. The crust will fall apart is it is not sufficiently compressed. I use a rubber mallet with a flat surface to compress it, and it works well. If you don’t have one, a flat spatula is equally good. Prepare the base earlier and leave it in the refrigerator. The butter in it will solidify so the cake base will become firmer to handle. Mix (A) with an electric mixer until it becomes fluffy and homogenous. Beat (B) with an electric mixer until the cornflour is well-mixed with the egg. Combine (B)and (A) and mix well. Beat (C) together until it can form stiff peaks when the mixer blade is lifted up. Add to the mixture of (A) and (B). Beat the egg whites with the caster sugar, i.e. ingredients D over a hot water bath until soft peaks are formed. Fold the egg whites into the batter in (3). Crush the biscuit and mix with the melted butter (as in E), Place the biscuit/butter in a round baking pan. Press to form a firm base. Pour the cheesecake batter onto the biscuit base. Place the unbaked cheesecake in a hot water bath. 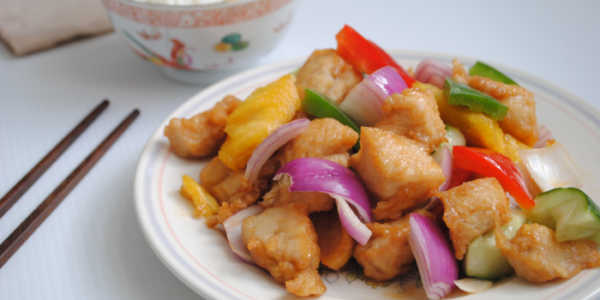 Place it in a preheated oven and bake at 160°C/320°F for 30 minutes, and then 150°C/300°F for 60 minutes. Remove from the oven. Keep in the chiller after it is no longer hot. If you encounter any audio / visual problem of viewing this video, you can view it from YouTube by clicking this link, which will open in a new tab. I like to tweak the recipe from time to time, hoping to lift the recipe to the next level. Unfortunately, it does not happen every time. 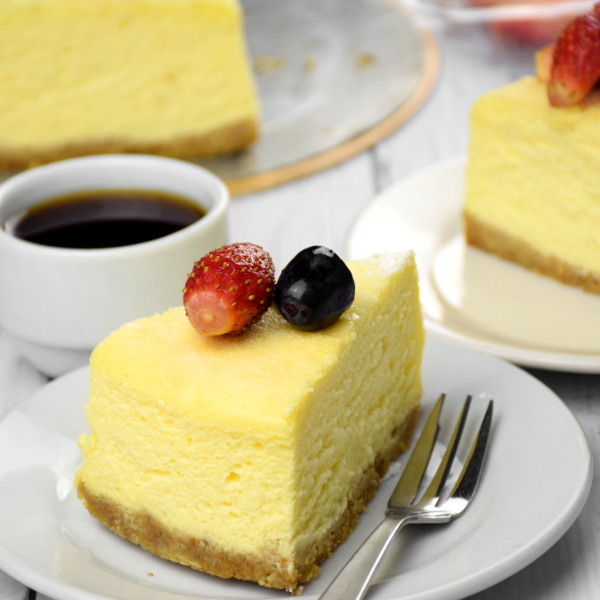 In the original Japanese cheesecake formula, only half of the egg whites are used for the meringue and the mix the other half with the cream cheese and cream and butter. Recently, I use all the egg whites to make the meringue, hoping that the cheesecake is even lighter and more tender. But it does not turn out as expected. 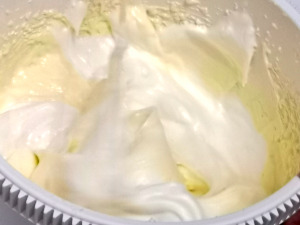 The larger amount of meringue indeed produce a larger volume initially, but the texture is too porous that it partially collapsed on its weight. I then increase the amount of cornflour, hoping to firm a sturdier texture to support its weight. However, the cheesecake becomes dryer and get stale much faster than the original formula. Eventually, I reverse back to the original recipe, and everything is looking ideal again. Certainly, that will not stop me, and I will continue to explore to improve whenever is possible. 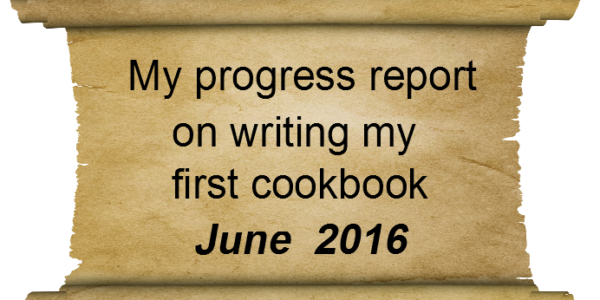 Why I wanted to write an Asian cookbook? 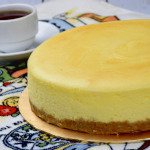 14 replies to "Japanese Cheesecake Recipe (Soufflé Cheesecake) with seven simple steps"
I adore cheesecake and this looks perfect down to the very last bite! Great texture and the addition of the lemon juice is fabulous. Thank you Kimberly, I am your fan of Darling Gourmet too. This looks great. I like how you folded the meringue. It looks fluffy and light. Thanks for dropping by my blog. I wish this article is useful to you. As for the meringue, I prefer soft peak stage- easy to fold and fluffy. The size for my cheesecake – 8 inches in diameter, round. Hope you all the success in making the cake. hi, how many egg whites did you use for the meringue? to clarify, the whipping cream is cold when whipped and added to the cream cheese mixture cold? Thank you so much for pointing out the confusion in the Japanese cheesecake recipe. I have made the amendment immediately. It should be 2 egg whites for the meringue. Since I use 3 eggs in total, the remaining 1 egg white and 3 egg yolks are mixed with the cornflour (which is Ingredients (B). As for the cream, yes, beat it cold. Cold cream is easier to beat until it forms peaks. Add the beaten (and now thicken) cold cream to the cream cheese mixture. Hi, I have a baking question. My favorite dessert is cheesecake and I have baked quite a number. One of the recipes I came across calls for heavy cream instead of sour cream. I cannot find any heavy cream anywhere. What is available is whipping cream with 36% fat content. If i am not mistaken heavy cream is supposed to have a much higher fat content but i cannot find anything in the stores that’s more than 36%. Any suggestions.? Thank You. My understanding is that any crea1m that is above 30% of the fat can be whipped and increase the volume. So heavy cream of 36% is whipped cream. See image attached, last paragraph, page 38 of On food and cooking. Hi, I’m from the US and I’m having a hard time reading the recipe without american measurements. 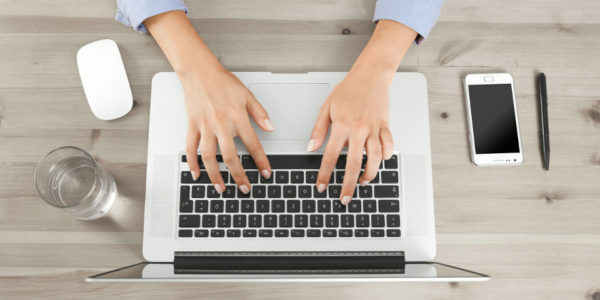 It’s difficult to find consistent conversions online. Could you detail these measurements in cups?